I am not myself in the winter time. I’ve been told it’s Seasonal Affective Disorder and I’ll agree with that. If you look at my social media posts from mid January through March from years past, there is a definite cycle to my depression, insecurities, and general feeling of malaise. I second guess everything about myself, even how I practice witchcraft. I started dabbling in spellwork back in 1991 at the ripe old age of 17 and over the years have pulled a little of this or that from books or others practices. I have created my own version of the practice. I don’t exactly consider myself Wiccan, much more of a Cottage Witch with a mix of Solitary, Eclectic and Hedge witchery, shamanism , Buddhism and Pagan influences. And I think that’s what many of the wise women and men did; they took what they knew and what they had and melded it together with intention for the work they had set forth. They created their own path. I have had confidence in my practice for 26 years, until this past winter. Three Hares and I started this blog with lots of excitement, but I started to doubt myself because the way Three Hares has always practiced is different than mine. She had been in a coven, I have always been solitary. She is much more ritualistic, as I use much more of a visual and thought based magick. 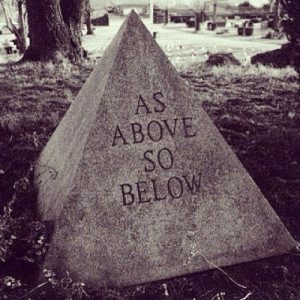 I decided to go back and refresh my book knowledge and started listening to audiobooks, vlogs and podcasts from some of the best authors in the witchcraft circle. Hours upon hours of listening. For weeks, every waking spare moment, my ears were being bombarded with how this witch does this or how that one does that. None are quite the same. I began to get confused and started thinking my way wasn’t good enough. I didn’t think I had anything to add to this blog anymore and felt very unsure of myself. Until this afternoon, that is. Today, it was 71 degrees, here in Pennsylvania. I laid in my hammock under a small Crab-apple tree whose branches are just beginning to bud. The branches are gnarled and bent and reminds me of how a witches fingers are always portrayed in the movies. The sun shown brightly through each finger and warmed my body. The birds were chirping, my wind chimes were blowing in the breeze, more than I’ve heard them in a long time. I don’t know if that is because they were blowing more, or I just finally opened my ears and mind to notice them. Neighbors have already begun to cut their lawns, so the smell of fresh grass wafted in the air as I lay there looking up. All of a sudden, it dawned on me. We are all different. My season of growth and refreshment may be in the sun, where someone else may prefer the snow. My style of spellcraft has always worked for me and has always brought me, my family and friends peace, success and happiness. Just because it is not exactly how someone else may do it, doesn’t mean it is not right for me or someone else out there just learning how they want to follow this world. We each choose our own path and sometimes we turn off to walk down another’s path for a while and sometimes we stay where we are, but we need to be true to ourselves and what works for us in order for it to be right. I hope that if anyone else out there is doubting themselves and the style they have chosen, this post reassures them to figure out what path they wish to walk. Magick is within ourselves and our confidence in ourselves. Follow your own path even if you have to forge a new one!